It is important to consult your veterinarian about your puppy's health concerns. This guide is about caring for a puppy with parvo. Ok, before the editors can place their "disclaimer" along with this post, I am going to place it here first. We full well understand NOT everyone is capable or has the knowledge we have behind us. So with this said, home treatment can be as expensive as vet treatment. Knowledge of animals is what helped us. Also, there are 2 forms of Parvo. We were lucky enough to be dealing with the intestinal type. If your dog develops the cardiac type, seek immediate vet help. Editor's Note (the real one): Please discuss with a professional health care provider before starting this or any home treatment. We have a pair of 7 month old Bull Dogs. Both had 1 set of shots. We received them as strays, so true age and health issues are truly unknown. Our male began showing signs and symptoms on Sept. 8th. On Sept. 11 we were told he had Parvo. On Sept 12, he received 1 anti-biotic shot and was sent home from a vet friend's home with orders to take him to the local vet hospital. Instead, we did our research and the following is what we did. This worked for us, I will not guarantee it will work in all cases. Our first stop on our way home was the grocery store. We picked up Pedialyte, liquid infant anti-nausea medication, and Peptobismal. Every 30 minutes we gave him 10 cc of the Pedialyte. We also gave him 10 cc of Pedialyte with 5 cc of anti-nausea medicine. The next morning, we made a run to town (we live in a vast farming community). First stop was more Pedialyte ($3.00 per bottle), rubber gloves ($5.00 per box), 1000mg MSM ($5.00 per bottle). The next stop was the health food store for 90 ppm colloidal silver ($20.00) - this item is a MUST, DO NOT skip it; Peppermint oil ($10.00), goldenseal root ($12.00), echinacea ($10.50), and Source of Life Gold Liquid vitamins ($16.00). All of these items are in liquid form. From there we went to the feed store and picked up antibiotic ($40.00) and needles. **Again DO NOT attempt this if you have never given an animal a shot before. My family are ranchers and so I was raised around this stuff. Now, as our dog was throwing up we did an enema treatment. This is a must, and will get the medications into your dog without them throwing them right back out. Recipe to follow at the end. We did the enema 3 times the first day, 2 times the next day, and 1 the final day, only because he started eating and drinking on his own. First Day: Pedialyte and silver in between enemas. Antibiotic shot in the morning (only one per day). Second Day: Rotate Pedialyte and Pedialyte with silver between enemas. Antibiotic shot. Third Day: He was drinking on his own, so there was no need for Pedialyte. Now our female was starting to show signs, so we started her on the treatment early and her signs are not nearly as severe as our male. It was more or less similar to depression. Honestly, if you are getting a new puppy, most of these items can be purchased and kept on hand just in case. Mix all of this in a purchased enema bottle. We used disposable ones by emptying out the included solution, rinsing it out, and then using the bottle. Make sure mixture is mixed well and MSM is dissolved, coat tip with some form of non-toxic lubricant and make sure back bone is straight. We discovered that it was best to lay our dog down, straighten back, and insert, talking the whole time. We then rubbed his belly afterwards and he thought he was getting lovies. Anyways, this is what worked for us. We do NOT guarantee it. The medications in the enema are the same as what is in Parvaid. That is why we purchased them. We did not/could not afford to wait. As for food, we bought turkey with rice baby food and mixed it with baby rice cereal. When he took his first bite we knew we had conquered this deadly illness. One more thing, if your dogs show sign of Parvo, do not give them their next round of vaccines. This will make things worse. This includes any and all dogs exposed. This comes straight from our vet friend. I found online a herbal medication for parvo, It's called Parvaid. Editor's Note: If you have experience with this product, please post your feedback here. My 3 month old German Shepherd has parvo. I took him to the vet and it's been 4 days, but he still vomited more than 10 times last night. I couldn't sleep till morning. In the morning he pooped green coloured stool? Will he survive? Please help I'm so frustrated. I am sorry your puppy is not feeling good. Is he throwing up worms that you can see? Are there visible worms in his stool? I like to give Nemex 2 wormer, and you can get it at Tractor Supply. If the pup has parvo, then it will have to get through the virus and its course. The main idea to get through parvo, if the pup has it, is to keep the pup hydrated. I wish you the best and am sending prayers. My puppy Peppa has parvo. It has been three days now and she drinks water fine, but I can't get her to eat anything. I need help on how to feed her. It is normal for parvo puppies to not eat for a few days. Drinking is essential. You can begin to try to tempt her with foods she likes that are easy to digest. When they are very sick in the 1st few days they cant digest much anyway. You really need to ask your Vet how to get her eating again. I had 7 puppies; 5 of them have died from parvo. Please help me with the last 2. One died at first from parvo without me having any idea about what was wrong with it until a vet told me he died from parvo. I quickly took the rest to a vet 2 weeks ago, but 4 died eventually. Currently I have two left. They have taken all their shots now for about 7 days. They are now at home and I give them subcutaneous fluids as directed by the vet. They can now eat and drink on their own, but are still weak and sleep a lot. They also have watery stools. Can you help me with this? I am very devastated after already losing the 5. Clean your house with a diluted bleach solution. Parvo can live inside for six months. Do not take them outside until their are fully vaccinated. Drinking at this point is more important than solid food. Keep in touch with the vet. My puppy Benson has parvo. We took him to the vet who gave us IV bags and the shots for a 3 day period. So far he has had all 6 shots, he doesn't like us using the IV bag on him anymore. He is active again, drinks water, and wags his tail and licks us again, but for some reason I can't get him interested in food. It's been awhile since he's eaten, 3 days to be exact and it's worrying me. I've tried rice, baby food, and just creamy stuff so it's easy to go down. Anyone know anything that he might be interested in or a trick to ease him into eating again? Since the puppy is up an active here is some foods you can try. It is recommended to give ice chips to the dog if he is still vomiting. Otherwise, start the dog on a bland diet. You can make this yourself at home. You will need 1 1/2 cups of creamed cottage cheese, 1 large hard boil egg, chopped, and 2 cups of cooked cream of wheet or rice. You can also use 2 cups of cooked white rice. Not instant rice. Now you will feed the dog 4 times a day with this bland diet. You will only give him 1 to 2 tablesppons of the bland diet at a time. If the dog starts to vomit again, you will stop feeding him the bland diet and go back to only feeding him ice cup chips. After each feeding make sure he drink or you give him 1/4 cup of water. Continue this for 2 to 3 days. If the dog is doing good then you can start to mix a small amount of his dog food with the bland food. He should start eating again after 6 to 8 days. My 7 month old puppy was diagnosed with parvo. The first 24 hours I gave her Pedialyte and chicken broth every hour on the hour. She does not have diarrhea and she is not vomiting. She was eating and drinking on her own the first night after a few hours of giving her Pedialyte. Now she has stopped eating again. And she hates the syringe. I am exhausted. After the first 24 hours how often should I feed her using the syringe? Still every hour or what is recommended? Since she is not vomiting and doesn't have diarrhea, that is good. She needs to drink and be hydrated. Call the vet if you have concerns. As long as the dog isn't vomiting this is a good sign. I'd try and see if she will drink a little water on her own. I know every hour on the hour is a lot of work. If you are really concerned there is another solution to this. You can try asking the vet to put an IV in and get some bags of liquid to feed her in the IV. Normally, if the dog is really sick this is how they start the treatment. Otherwise, I'd try to get her to drink on her own. Other than these two solutions there isn't much else you can do at the moment. My 5 month old, 25lb puppy has parvo. She received her parvo antibiotic shots yesterday plus I'm giving her antibiotics every 12 hours. She has not vomited since yesterday morning. Is it OK to feed her kibble? She started showing symptoms two days ago. She is constipated and hasn't pooped in 2 days. But she is fully alert and pretty energetic today. She can drink water on her own. I didn't feed her for 24 hours. I have only been giving her Gatorade every two hours. She ate 1.5 cups of kibble today is that safe? The vet should have given you a diet plan for her to follow. If she is constipated, that can cause further troubles so make sure she gets plenty of fluids to help off set it. If my 2 month old puppy has parvo, could I give him his 1st shots or do I wait til after parvo treatment? You cant give parvo vaccinations to a dog who has a parvo infection. My 6 month puppy has parvo and I don't have the money to take him to the vet. I don't know how to treat for him at home, does anyone have any tips that they can give me on how to care for him? It is very difficult to treat a puppy with parvo at home with no help from a veterinarian. Even if you have the medicine they need they vomit a lot and cant benefit from it. They get an injection at the Vet. 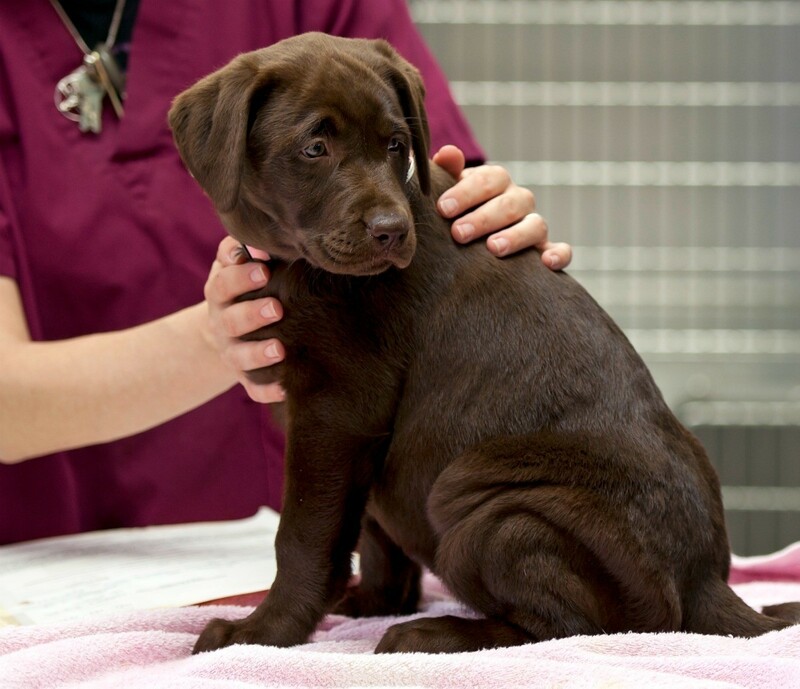 Many Vets will give your dog the shot they need and let you take them home and care for them. This way is less expensive and gives the puppy a chance. You may get lucky and your puppy may have a light case and pull through. But your odds are not good and I would find a way to see a Vet. asap. I guess I'm just a paranoid dog owner who needs some questions answered. I have a black Russian terrier puppy who is about 5 months old. Since I just got him his vaccinations weren't started so I did start his course right away, but right after his first vaccination he became lethargic and ate less than he usually did. Right away I knew something was wrong so I took him to the vet and sure enough it was what I feared most, parvo. I started with supportive meds right away and the vet gave him a daily dose of one 250 ml IV fluids and anti nausea shots. We're still pulling through this even though it is his eighth day and he is showing signs of improvement. On a side note I would like to say he did not puke blood, but instead clear liquid and he had brown diarrhea with a foul smell. I just wanted to know your opinions on this. He also ate some doggy kibble yesterday. I do have other dogs, but they have been through this ordeal and having strong immune systems; they recovered within two days. I should also note that since I live in Peshawar, Pakistan there isn't any proper type of hospitalization and the vet recommended I take him home. If your dog is eating solid food, he is on his way to recovery. Some dogs take longer than others. If he has a setback you can always call the vet. What kind of steady care do I need to give my puppy with parvo? I took him to the vet on Monday and he was tested positive with it. Ever since then I have given his meds on time and have given him Pedialyte through a syringe every hour. Is this enough or can I do something better? Basically, that is all you can do. Keep the dog hydrated and make sure he is getting his meds on time. Try to encourage him to drink on his own, but if he refuses, keep giving him liquids with the syringe. As long as you are following the vet's instructions, you are on the right track. Even with the best of care, some dogs don't make it. Hopefully yours will. My 9 month old Rotti is on day 6 with parvo and treatment. Last night and today he just wants to sleep; is that normal? Just like people, some animals can react to treatment faster than others and some slower. Continue to monitor for vomiting/diarrhea and weakness. 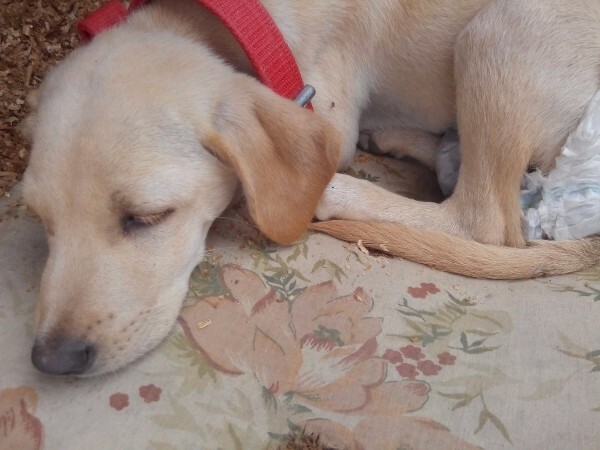 If the puppy seems extremely lethargic (worse than you have seen so far), go back in to see the vet as soon as you can. It is not abnormal for them to be somewhat tired while they are fighting this off. My dog is suffering from parvo. For the last 4 days he has been vomiting and yesterday we took him to the vet. He is not insuring us that our pet will be fine or not. His vomiting is less as compared to earlier days. Please tell me if I should give him water to drink or not. And in what time he will be back to his normal health? Please help me. We love him a lot. My dog Penny has been suffering from the parvovirus for almost 3 days. We have taken her to the vet and they said she's gonna be fine, but by looking at her I don't think she's fine enough by getting treatment too. She's not eating anything; what shall I do? For keeping her hydrated what shall I do? Basically, there is not much you can do until the dog starts to feel a bit better. I know it is hard and it really hurts to see your dog laying there and not eating. Normally after the dog is treated it can take up to 5 or 6 days for the dog to eat again. You can try feeding the dog a small amount of cooked pasta with some boiled chicken cut up really small. You can use some of the chicken broth in the mixture to give it a bit more flavor. Until the dog is feeling better they just won't eat. I had to deal with this with one of my dogs and I was so worried about the dog. It took him 5 days before he would eat again. My puppy has been diagnosed and tested for parvo today. Before I took her to the vet she was vomiting and had diarrhea. The vet supplied a syringe to force liquids into her every half hour, she also gave my puppy 2 injections. She told me if the vomiting continued to take her back. But since being at the vet she hasn't vomited or had diarrhea. She has been walking around to her water bowl staring at her water as if she wants to drink, but won't. Are these good signs she is getting better? She is improving and moving around. It is a good sign that she is no longer throwing up. You'll need to encourage her to drink. She might want to drink right away because she was throwing up. In this case use the syringe and give her water. Wait till she no longer has diarrhea or vomiting for 24 hours and try to feed her a tablespoon or two of cooked pasta to start off with. 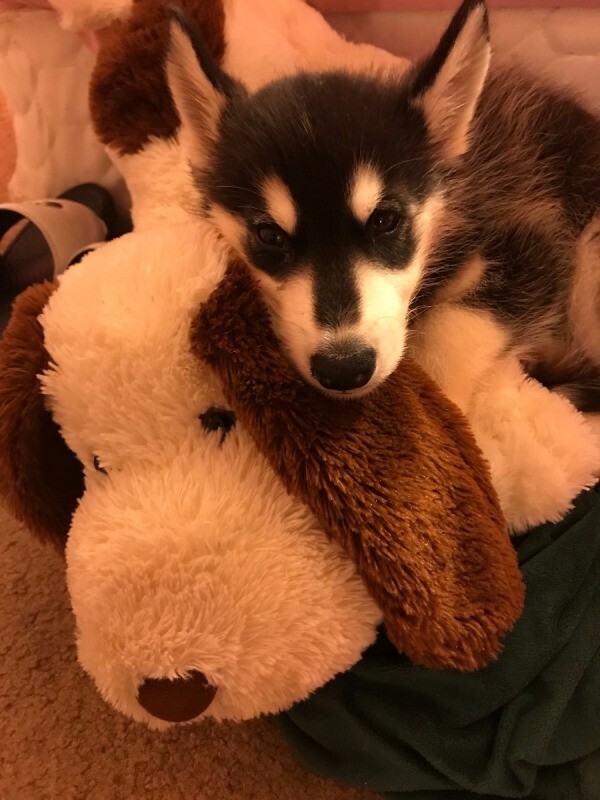 I got a 2 month old male Siberian Husky on Saturday and he was fine until he started showing signs of parvo, due to lethargy and not acting the same. I took him to the vet and they confirmed it was parvo. I had the right medicine and they just gave me nausea medicine. It's Friday now and he is drinking water and his throw up isn't bloody at all, it is clear like water with phlegm like stuff. He still has green/rusty colored diarrhea. When will my puppy be fine or start eating chicken with rice? The dog needs to be kept hydrated now and his medicine given to him only. Once he has stopped pooping greenish colored poop for at least 24 hours you can't feed him at all. You should monitor him closely an later on start him on a small bland diet to start off. But wait until he is no longer pooping green to do this one. My puppy has parvo. We went to the vet and got the IV and the antibiotics. My question is what process will I be going through with her? Will she be throwing up often? What can I do to help her though this? Today is the 3rd day of her sickness. I gave her the nausea medicine this morning, but she's throwing up close to every hour now. Also she has only gone number 2 once today and it was a bit runny. Should I be worried that she is not going? She has also gone pee once too. The first 72 to 96 hours are the worst for the dog. Basically, all you can do is keep her on the IV, make sure she has fluids, give her the medication and make her comfortable. You should start to see a change in your dog around the 4th day. Until the dog has stopped vomiting and having running stools it is best to keep them on liquids only. After you see the dog has stopped vomiting you can start her on 1 to 2 tablespoons of a bland diet. This is cooked white rice or even some cook pasta. Keep giving her plenty of fluids and make sure she is drinking some water. If you don't see a change by the 4th day, I'd call the vet and see if you need to take her back in for another shot. Just keep a close eye on her and monitor how often she is drinking. My 2 month old puppy has the parvo virus. Today is the 3rd day and she doesn't want to eat and doesn't want to drink water. I took her to the vet and the first day she was injected with fluids, Cerenia and famotidine. She did well the first day, she ate a little bit and drank water. But the second day I took her, they did the same treatment, but she hasn't been eating/drinking since then. And she started to vomit clear fluid. What should I do? You need to take her back to the vet immediately. Normally many vets will send home a bag filled IV fluids for the dog that you are to give them. Since your dog is vomiting now it is important that you take them back to the vet immediately. Most vets will or should keep the dog for a day or two to give them IV fluids to help the dog so it won't dehydrate. We found out yesterday that my daughter's puppy has parvo. She is getting her meds and IV. She has been drinking in her own. But when my daughter went to pick her up she cried. Could this be because her stomach hurts from throwing up?